Pear & Gorgonzola Flatbread Recipe - Naan flatbreads topped with browned butter, pears, prosciutto, gorgonzola, walnuts and sage - the flavor combination is delicious! We ate these twice in one week! This recipe has been on my "to-make" list for a really long time. It was inspired by one of our favorite appetizers, Fiocchi. Fiocchi is a little pasta purse filled with pears and gorgonzola. The appetizer we love serves the fiocchi in a butter sauce with sage, prosciutto and walnuts. It is amazing. Chicken Legs has been on me for years to turn that appetizer into a flatbread. Well, I finally did and it was AMAZING! We actually ate this twice in one week. I used precooked Naan flatbread as the base. I like Stonefire Original Naan. I find it in the deli/produce area at the grocery store. 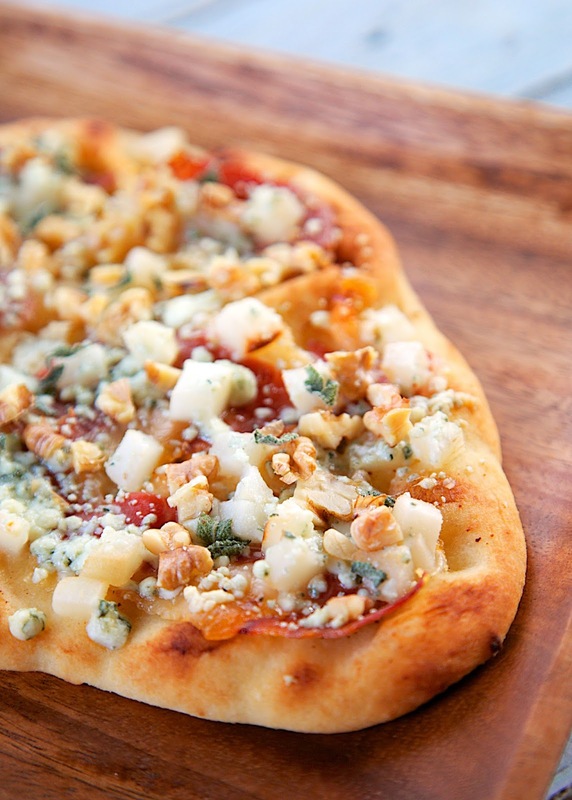 These Pear and Gorgonzola Flatbreads only take a few minutes to assemble and are super delicious. I am not a huge fan of gorgonzola, but it really works in this dish. The flatbread had all the flavors of our favorite fiocchi appetizer. It was a total success. Now I am off to make this again! Place butter in a small light colored saucepan. (You need to be able to see the butter turn brown.) Melt butter over medium heat, stirring constantly. The butter will start to foam. Continue cooking until brown specks start to appear in the bottom of the pan. Drop 2 sage leaves into the butter and remove from heat. Pour butter into small dish to stop the cooking process. Brush naan flatbreads with half of the browned butter. 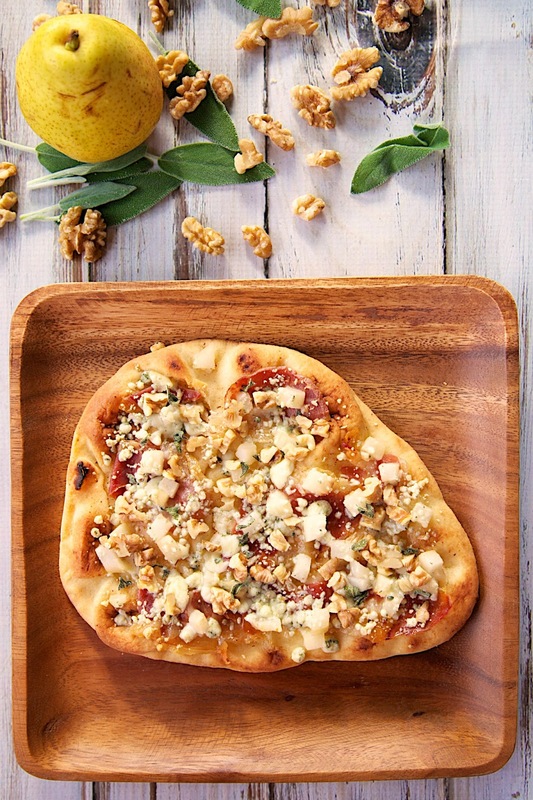 Top each flatbread with prosciutto, pear, walnuts and gorgonzola. Chop remaining sage and sprinkle over top of flatbreads. Place flatbreads on baking sheet and bake for 12-15 minutes. Drizzle remaining browned butter over flatbreads.